Grate zucchini on the fine side of a box grater. Place the grated zucchini in a fine mesh sieve and press out some of the liquid. If your zucchini are very fresh you may get 2 - 3 tablespoons of liquid. Discard the liquid (or drink it, mmm earthy!) Leave the zucchini in the strainer. Crack the eggs into a mixing bowl, but do not beat them until just before adding to the pan. Preheat a 10 inch cast iron (or non-stick) skillet over medium-low heat. Melt the butter. Add the garlic and shallots. Saute for 3 - 4 minutes until softened, but do not allow the shallots to brown. Add the zucchini and saute for 1 - 2 minutes until the zucchini begins to soften. Beat the eggs with a whisk until they just start to foam. Add the basil and parsley to the eggs. Beat the eggs just slightly once more then add the eggs to the pan. Be sure that the ingredients in the pan are well distributed among the eggs. Sprinkle the peccorino and pepper over the top of the eggs and place pan in the oven. Bake for 10 - 15 minutes. Check to make sure the frittata is set before removing from the oven, but not completely solid. If you beat your eggs correctly the frittata should have puffed up a bit. Wait for the frittata to settle before cutting. 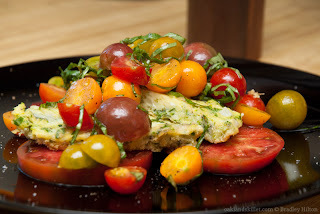 Serve with a drizzle of olive oil and garnish with basil or parsley or whatever you like. Notes: Prepare all the ingredients before starting to assemble the frittata. 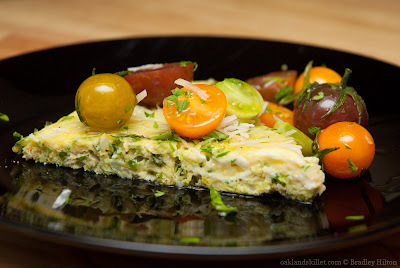 This frittata cooks very quickly especially if you are using a cast iron pan, which I recommend. Hi Bradley, Yes large zucchinis are called marrows in England too. They are very watery and often eaten stuffed with something, or made into jam with ginger. Marrow and ginger jam was probably some wartime austerity item, but it is a good combo. Small marrows are called courgettes there, the French word for zucchinis.